I’ve always felt that the best training is the kind that delivers rewards both inwardly and outwardly – where your fitness increases, and your running becomes more inwardly blissful. What’s the best kind of training to achieve both of those goals? I spent 20 years searching for the answer, and I gradually came to understand that the “method” is both simple and complex. Simple, because really, it’s just asking a fairly straightforward question: “What’s the best way to train?” In my experience, when you’re training well – when your training is in harmony with your body’s true needs – the “joys of running” follow naturally. 1. Body. How can I “listen to my body” and actually hear its messages, so that I can fine-tune my training in harmony with its ever-changing needs? 3. Will. How can I run with strong will power, without getting injured or overtrained? 4. Mind. How can I focus and quiet my mind, so that I can enter the enjoyable sports “zone”? 5. Soul. How can I commune with the wisdom and joy of a higher power when I run? At this point, I wouldn’t be surprised if you’re feeling a bit suspicious. Perhaps you’re suspecting that the “formula” will turn out to be extremely complicated, that it will take 300 pages to explain, and that there will be a final cop-out and collapse in the last chapter. Yet the answer to those five questions turns out to be surprisingly simple. Science. We read articles and books by respected coaches and sports scientists, and we do as they recommend. Trial and error. We thumb through the pages of our training diary, and we repeat what worked in the past. The experiences of other runners. We read what highly successful runners have done, and we imitate them. There’s a lot to be said for each of these approaches. But notice that just one of them – trial and error – addresses the unique needs of the individual body. And, even so, the most meticulous training diary can only tell us what worked when conditions were almost (but never exactly) the same as they are today. Let’s take a closer look at the first approach – science – since it’s probably the one runners trust most. There are lots of books and articles on training, based on sports science. Yet I’ve always felt that there’s an important element that they tend to leave out. The running magazines tell us, over and over, how to improve our 10K and marathon times, based on the latest scientific research. But they don’t tell us very much about fine-tuning our training “on the fly,” from one moment to the next, during each and every run. Yet, as every newcomer to running quickly realizes, rigidly following an inflexible training schedule is a sure recipe for disaster, since each body is unique, with unique needs that change daily. Science looks at the outside of running. It studies the body as a functioning machine. Science describes an imaginary “average” body, based on poking and prodding hundreds of bodies. But when we look under the hood at the individual body, the picture becomes vastly more complicated. The body that we must run with isn’t a scientifically averaged body; it’s a specific organism that reacts in unique ways to the countless factors that may affect it on a given day: sleep patterns, diet, the weather, yesterday’s training, stress at work, and so on. Not to mention the factors we’re born with and can’t change: our VO2Max, biodynamics, etc. When it comes to planning our training, clearly, it’s the individual body that counts. Yet the sports scientists hardly ever try to tell us how to “listen to our bodies.” Certainly, they advise us to take our morning pulse and monitor the other physical markers of overtraining. But they don’t tell us how to listen to our bodies from one moment to the next, so that we can avoid overtraining in the first place. Don’t get me wrong, I’m not “against” science. In fact, the sports scientists have given us wonderful insights into how our bodies work. But they haven’t done a very good job of telling us how to individualize our training. Just hours ago, I read a New York Times article about new research that completely discredits the lactic-acid theory of fatigue, which for 80 years was considered an unassailable pillar of sports science. It seems that lactic acid doesn’t “cause fatigue” after all, as we were led to believe. In fact, lactic acid is an important fuel for the working muscles. "It’s one of the classic mistakes in the history of science," Dr. Brooks said. [George A. Brooks, professor of integrative biology at the University of California, Berkeley] …. Yet, Dr. Brooks said, even though coaches often believed in the myth of the lactic acid threshold, they ended up training athletes in the best way possible to increase their mitochondria. "Coaches have understood things the scientists didn’t," he said. In fact, all of the most successful training systems have been empirically derived. Arthur Lydiard, the legendary coach whose methods were adopted by successive waves of Olympic champions from New Zealand, Australia, Japan, Finland, Mexico, Africa, and the US, evolved his ideas by first testing them on himself. When Lydiard wanted to know the best weekly training mileage for a talented distance runner, he ran 80-300 miles a week and painstakingly tracked the results. Based on this and many other experiments conducted in the laboratory of his own body, Lydiard evolved the systems of "periodization" and "peaking" that would dominate the training of world-class distance runners for decades, and that are enjoying a modest revival today. Everything is limited by the body. You can never advance your training faster than your body’s ability to recover. And some bodies take longer to recover than others. You can only train as hard as your own, individual body can manage. It cannot be emphasized strongly enough: every body is unique. Thus, it’s extremely important to find a way to “listen to the body” – to know, with certainty, what your own body’s needs are, day by day, so that you can train accordingly. What instrument can tell us, clearly and unmistakably, the kind of training that will keep the body healthy and nudge it to improve? It’s easy to know after a run if you’ve done too much or too little. That’s why we keep training diaries: to learn, over the weeks and months and years, how our bodies generally react to different kinds of training. The training diary can help us make better decisions, based on experience, logic, and common sense. But what if there were also a way to know while we’re running if what we’re doing is exactly the right thing? I’m not recommending that you throw your training diary away, or abandon your common sense and reason. But one of the best tools I’ve found for knowing what will improve my fitness and the inner quality of my runs is intuition – the calm, impartial feelings of the heart. Many years ago, I began to notice that the subtle feelings of my heart were trying to tell me the kind of training my body “wanted” on a given day. At first, I rejected those messages, because they often seemed to be telling me things I didn’t want to hear – like Slow down! Or Pack it in! – Go home! Also, because I thought it was kind of airy-fairy to be running around “listening to my heart.” But when I started taking those signals seriously, I began having deeply enjoyable runs more often, and I was able to make better decisions about my training. I realized that paying attention to the heart wasn’t “airy-fairy” at all – that logic and feeling are complementary; that they are equally invaluable tools for a runner. A common prejudice in our reason-dominant culture holds that we can follow either reason or feeling, but not both. Partly, of course, it’s true – emotional feeling can be very misleading. Yet a landmark study that I’ll cite in Chapter 6 (“Focus on Feeling”) found that people whose brains had been damaged by physical trauma, impairing their ability to feel, had a terrible time making decisions, even though their reasoning powers were intact. There’s nothing terribly mystical or spooky about intuition – although it definitely extends into spiritual realms. We use intuition all the time in our daily lives, even if we don’t call it by that name. Imagine that you’re trying to decide which of two equally qualified job candidates to hire. One candidate gives you a good feeling, and the other makes you nervous, though you can’t put your finger on exactly why. Your spouse suggests that you travel to her parents’ for Thanksgiving. You agree, but on some deep level of your awareness, you know you won’t be going. Sure enough, your youngest child falls ill and the trip is cancelled. You respond to an ad for a used computer. You drive to the seller’s home, where everything seems fine. But you have an uneasy feeling – a whisper of intuition that seems to be telling you “Don’t do it.” With regret, you leave without buying. The next day, you find a more capable PC for less money. Sit for a while and relax. Be grateful for the break in your day. Savor it fully, and when you’re feeling calm, turn your attention to the decision before you and review the alternatives. As you contemplate each option, check the feeling in your heart. Try to find a calm, impartial level of feeling that isn’t affected by personal prejudices and desires. Chances are, one choice will generate a more positive, upbeat feeling than the others. Warning: don’t try this with really big decisions! – at least not until you’ve had some practice. Decisions about relationships, or spending money on cars, computers, ice cream, and running shoes are seldom easy to contemplate with a calm and detached heart. In fact, the most difficult part of using your intuition is persuading the heart to be calm and impartial. There are many ways to improve your ability to hear the intuitive messages that your body is sending. For example, research that I’ll describe in Chapter 5 shows that anything you can do that generates harmonious, happy feelings in your heart will improve your ability to focus your mind, be calmly impartial, and know what’s right. 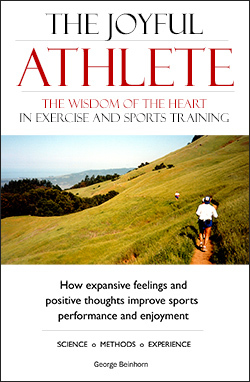 Throughout the book, I’ll suggest ways to generate those positive, expansive feelings while you’re running. And I’ll describe some of my own struggles to find that detached, intuitive place in the heart. If you take only one thing from this book, I hope it will be this: when you’re trying to find the intuitive, happy part of your heart, don’t try to get there with your mind. That never works. Instead, go straight to the heart. The quickest way to find the intuitive heart is by using “heart-means.” Do what makes you feel happy, calm and expansive, whether it’s singing to yourself, remembering a happy time, thinking of a friend, sending silent blessings to loved ones, or opening your heart to the rhythms of running, or to nature, or spirit. I practice this all the time when I train. At the gym, for example, I’ll finish one exercise and take a relaxed walk around and ask my heart which exercise I should do next – I’ll think of various exercises and see which one evokes a feeling of joy. I wear a heart monitor at the gym, because I’ve learned that my intuition is clearest when I’m feeling calm, and I’m calmest when my heart rate falls below 65% of maximum. That’s another reason I don’t rush from one exercise to another. I wait for my heart to get quiet before I make the next decision. I do have goals when I work out – I don’t wander around the gym aimlessly and let my workout be guided by whimsical feeling. I have a mental repertoire of exercises that I can choose from to accomplish my goals. As I stroll through the gym I’ll consider the alternatives and see which one feels most joyful. This works very well. During the workouts where I’m able to stay focused and intuitive, I feel increasingly happy and joyful. And because I’m having a good time, I’m likely to work out harder. When I follow my “system,” I leave the gym feeling chock-full of health, good feelings, and vitality. I’ve discovered a way to amplify the results. As energy starts flowing through my body, and my heart and mind begin to catch on to the fun of the workout, I’ll remind myself that my joy is like a lake <– if I try to hoard all the water for myself, it will become stagnant and dry up, but if I let it flow out to others, I'll find a fresh flow coming in from the “other side.” So I try not to get too engrossed in getting joy for myself alone. Instead, I try to feel that those currents of joy are spreading out to bless the other people working out. This makes me feel happy. I’ll see a young man who’s cruising on the treadmill with beautiful running form, or an older woman who’s focused on her leg-pressing, and I’ll feel the joy that naturally wants to be on their side and bless them. I hardly ever say anything – maybe I'll say “Well done!” silently – but I feel my joy expanding to include them. This method works equally well when I’m running. I’ll take a longish warmup to explore the “harmony zone,” where my intuition is strongest. (More on the harmony zone later.) Then I’ll decide what to do for the day, based on what my intuition seems to be telling me. Again, I don’t train randomly – on a day that’s scheduled for speedwork or a long run, I’ll train appropriately, but I’ll adjust the details according to what my body seems to be telling me it can handle. Do I make mistakes? You bet! As a stubborn old putz, my biggest downfall is a tendency to keep running when common sense, intuition, and a higher guidance are all telling me to pack it in and go home. Again, if your thoughts are scattered or unhappy at the start of a run, don’t waste time thinking and worrying about it, generating endless words. Instead, run your way to a happier “place.” (For more suggestions, see Chapter 64 “The Harmony Zone.”) When we’re deeply interested in something, the mind naturally and effortlessly falls into a focus. But, as I suggested earlier, trying to force the mind to concentrate is nearly always a waste of time. Let your thoughts wander and gripe, if they must. Just run. Let the rhythms of running, the movement of your footfall and breathing, gradually soothe your mind and heart until you begin to feel centered and cheerful inside. As you go on cultivating those good feelings, your mind will follow. In fact, it’s a time-tested rule: “The mind follows whatever feeling is uppermost in the heart.” When you’re feeling inwardly harmonious, you’ll make better mental decisions, based on calm, intuitive feeling. When you feel something strongly, your mind tends to trot along obediently and support that feeling. When you have a strong desire for ice cream, your mind supplies all of the logical reasons why you should have ice cream. When you’re feeling depressed and blue, your mind tells you all the ways life is cruel and unfair, and why the world owes you more than it’s giving. Isn’t it so? In this book, I’ll suggest ways you can use your mind to help stimulate positive feelings that will help you relax, focus, and hear the body’s intuitive whispers. In all of these practices, it’s good to be “intense, but not tense.” Relax! It’s not just important; it’s essential. To return to running and intuition. Years ago, when I first began to be aware that my body was trying to talk to me through my heart, I discovered that there was a running pace at which those messages were easiest to hear. I call that pace the “harmony zone,” and I’ll say much more about it in Chapter 5. For now, here’s a brief overview. The harmony zone is a subjective experience – it’s an actual “happy feeling” in the area of the heart. It can show up at any speed, depending on whether my body is healthy or unwell, rested or tired. The harmony zone is a subtle, enjoyable feeling of “rightness” that tells me I’m doing the right thing, the thing that’s healthiest for my body, and that will improve my fitness most efficiently. Those happy feelings show up only when I run at the pace my body “wants” for the day – the harmony zone pace. But if I ignore those signals and run too hard or too far, the good feelings fade, replaced by a subtle sense of disharmony. Listening to my body’s wisdom, speaking through the “voice” of the intuitive heart, I found that I could apply scientific training methods more wisely, with better awareness of my body’s true needs. Jeff Galloway, U.S. Olympian and author of the popular Galloway’s Book on Running, believes it isn’t actually possible to "listen to the body," as so many coaches recommend, because there are simply too many variables. Reason and logic can’t always tell us, for example, why our ankle is hurting, or why we’ve got less than our usual energy. But intuition – calm feeling – can often deliver the answer. Intuition works on many levels. Often, it’ll be just a simple, earthy feeling about what’s right – hmm, my body’s starting to feel unpleasantly pressed – better slow down, and maybe I should call it a day. More rarely, it can express a higher guidance, sometimes in startling ways. I was training for my first ultramarathon, a difficult 50K (31.1-mile) trail race in the high Sierra, with over 9000’ of climbing, when Achilles pain threatened to end my running career altogether. I was aware that shoe inserts (orthotics) might help, but money was tight, so I tried everything else I could think of, including anti-inflammatory drugs, motion-control shoes, icing, massage, taping, and cheap over-the-counter inserts. (I even stuffed leaves in my shoes!) But nothing worked. Finally, in a mood of desperation, I silently asked for guidance, and the answer came as a quiet intuitive voice that said: "Go see the podiatrist." I protested, "But I don’t have a lot of money right now, and the podiatrist will prescribe orthotics that cost $400 – plus, he’ll charge $40 for the office visit." The inner guidance was unimpressed. Again, it said, "Go see the podiatrist." Feeling that I had little to lose, I made the appointment – and, sure enough, the podiatrist wanted $40 for the exam and $400 for a set of orthotics. Seizing my faith in both hands, I told him to place the order and send me a bill. The next day, a friend that I hadn’t heard from in several years called to say that he’d just finished writing a book for racing cyclists, and he needed some photographs. He needed them quickly, and would I do them for $500? This story has repeated itself, with countless variations, in my 30-plus years as a runner, to the extent that, nowadays, when I need an answer to a problem with my training, I simply ask for it. Of course, it isn’t quite that simple, because getting clear answers takes a certain kind of asking, and it’s a skill that one develops over time. The answers rarely come in words, as in the story of the podiatrist. More often, it’ll be no more than a quiet inner knowing, or a subtle feeling of “rightness” when I try one thing, and a subtle unease when I try the opposite. Sometimes I’ll be guided to a person, a book, or a series of logical thoughts that hold the answer. Here’s another story from the “intuitive fringe.” This year, I planned to run and fast-hike 52.4 miles, a double marathon, as a fundraiser for a local school. I was enthusiastic about the route I’d chosen, which would take me from the north end of the Golden Gate Bridge, south through the neighborhoods of San Francisco, and along the flanks of the Coastal Range to our home in Mountain View. I swallowed my pride and planned a 35-mile run instead, on a lovely route from the beach at Half Moon Bay, across the Coastal Range, to the Bay in Mountain View. I’m certainly not going to claim that my intuition is perfect. But the guidance that I receive seems to “work” remarkably well. Fitness intuition has proved itself in the laboratory of thousands of miles of running. Fitness isn’t only about the body. In fact, the joys of a runner come in five flavors, corresponding to the five “tools” I mentioned earlier: body, heart, will, mind, and soul. In Fitness Intuition, I suggest that all successful, enjoyable training is expansive. “Expansion” simply means that we’re “stretching our edges” in meaningful ways. We’re using the five tools of a runner – body, heart, will, mind, and soul – to create greater health, love, strength, wisdom, and joy. When we’re able to do that, we feel great, and our training goes well. But expansion has its corresponding dual opposite. When we use those same five tools “contractively,” we invariably suffer. When we misuse our bodies by overtraining, for example, we shrivel and become less than we were: physically drained, emotionally withdrawn, with little energy for running, work, or relationships. Sports training is a continual battle to do the right thing. Winning the battle takes maturity, self-control, and patience. Fitness intuition – the calm and receptive heart – can help us know whether we’re moving in an expansive direction, toward greater fitness and joy, or if we’re headed in a direction that will lead us into a ditch. I don’t claim that this book will tell you all there is to know about intuitive running. But I am confident that the core principles will help you improve your training and create more enjoyable runs. 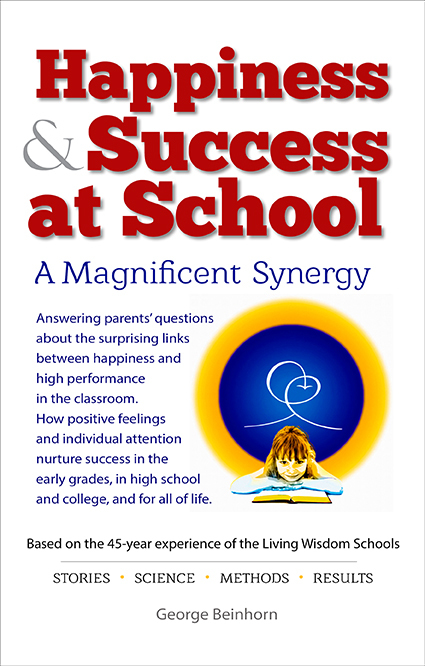 I’ll begin by presenting evidence that expansive attitudes are linked to success even at the highest, world-class level of sports (Chapter 1, “The Simple Joy of Sports”). In Chapter 2, “The Five Dimensions of Fitness,” I’ll describe the five tools of expansive training, and how nature develops those tools in us in a particular sequence during the first 24 years of our lives. In Chapter 7, “Can Slow Training Make You Faster?” I’ll firm up my case for the long warmup. And in the remainder of the book, I offer essays and stories that will give you a feeling for the methods and rewards of intuitive running. The path of a runner, though not always easy, holds the potential for experiences of great depth and joy. It’s my hope that this book will contribute to your enjoyment of the path. 1 “Lactic Acid Is Not Muscles’ Foe, It’s Fuel,” Gina Kolata, NY Times, May 16, 2006. Downloaded from< http://www.nytimes.com/2006/05/16/health/nutrition/ 16run.html?ex=1148011200&en=eef2896c5c908265&ei=5070 on May 17, 2006. 2Downloaded from http://runnersworld.com/article/0,7120,s6-243-292—10704-0,00.html on October 26, 2006.